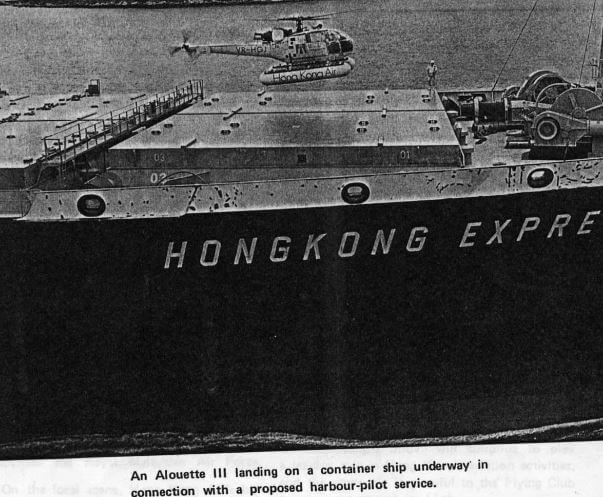 Hong Kong Air, the Colony’s only commercial helicopter service, commenced operations in August 1970 and initially was based at the Flying Club. 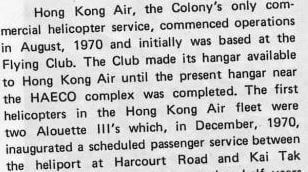 The Club made its hangar available to Hong Kong Air until the present hangar near the HAECO complex was completed. 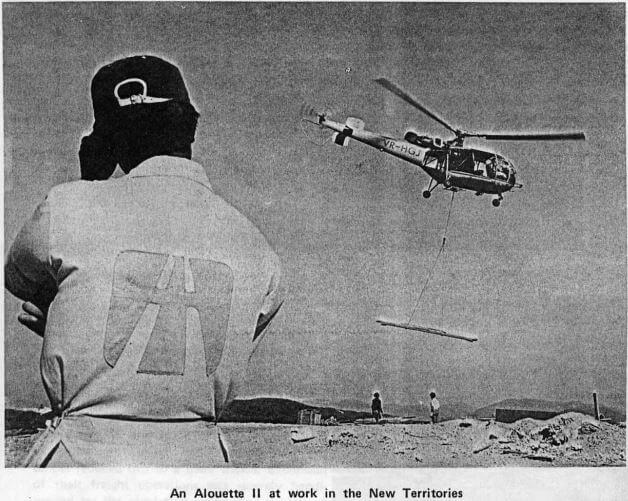 The first helicopters in the Hong Kong Air fleet were two Alouette III’s which, in December 1970, inaugurated a scheduled passenger service between the heliport at Harcourt Road and Kai Tak airport. During the next one and a half years the scheduled service became increasingly popular and carried over 5,000 passengers per month, resulting in the company adding to its fleet a 13-seat twinjet Bell 212 and a smaller utility helicopter, the Bell 47J2A. Many thanks to IDJ for sending the article. And to Richard McGeough for typing it out. The scheduled airport service, rated by some C.A.D. officials as being one of the most efficient in the world, was an airline in miniature, as passengers were completely processed through all immigration, baggage and passport formalities by Hong Kong Air and made immediate transfer to their departing international flights. No checked baggage was lost or damaged – a record which cannot be claimed by international carriers. Using the Bell 212 and an Alouette III, up to 19 seats were offered on each departure every thirty minutes from 0700 to midnight, in each direction. Many Club members will have heard the callsigns “Shuttle One” and “Shuttle Two” which were used by helicopters on this route. 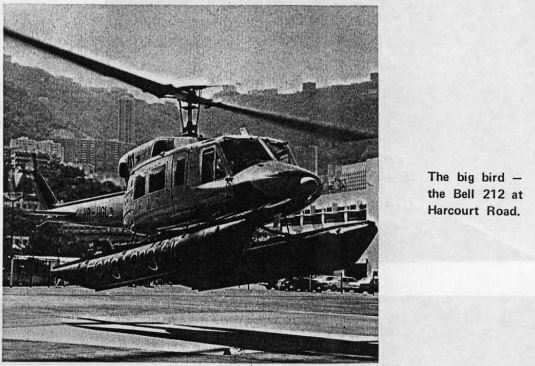 The opening of the cross-harbour tunnel in mid-1972 brought about a rapid decline in the number of passengers using the scheduled helicopter service although the main effects of this did not become apparent until 1973. The decrease in the passenger market had not been unexpected, and the reputation gained through the “customer image” operations during 1971 and 1972 allowed the company to expand into other work areas which could not have been as successfully exploited if it had been attempted in earlier days. The company now concentrates on underslung work, which it terms ROTORLIFT, and passenger charter work for various commercial companies and organisations such as the T.D.C., as well as ‘flightseeing’ tours for visitors and residents alike. The company now has a fleet of six helicopters, having added two Alouette II’s during March this year. The Bell 212 has been leased for oil support operations in Kalimantan (Indonesia) and the two Alouette III’s are now based in Kuala Lumpur on a training contract for the Royal Malaysian Air Force. On the local scene, Hong Kong Air’s helicopters are engaged in the construction and maintenance of the new RTV and TVB transmission towers, a micro-wave communication system and in the erection of power lines in the New Territories as well as several other construction tasks throughout the Colony. The method of working on these intensive operations involves positioning the helicopter to the N.T. in the morning, and flying six to eight hours during the day, with refueling on the site. Usually the only evidence of our presence is our regular “operation normal” calls on Sector frequency. In little over three and a half years of operation, Hong Kong Air has carried over 98,000 passengers and has flown over 5,000 hours. Currently, its helicopters are achieving a higher monthly utilisation rate per aircraft than at any time since they commenced operations. Macao remains a tantalising twenty minutes away, but because of inaction on the party of the U.K., Portuguese and Chinese governments, the service is still a remote possibility. In the meantime, the now familiar “yellow birds” will continue to play a leading role in Hong Kong’s aviation activities, and the company is grateful to the Flying Club for its assistance at its birth.